What could be better than a lovely visit on a summer day to the beautiful town of Niagara-On-The-Lake followed by wine tastings at two wineries, a tour of the brand new Niagara College Wine Visitor + Education Centre and then you finish off the day with a fabulous 7-course Italian banquet dinner. 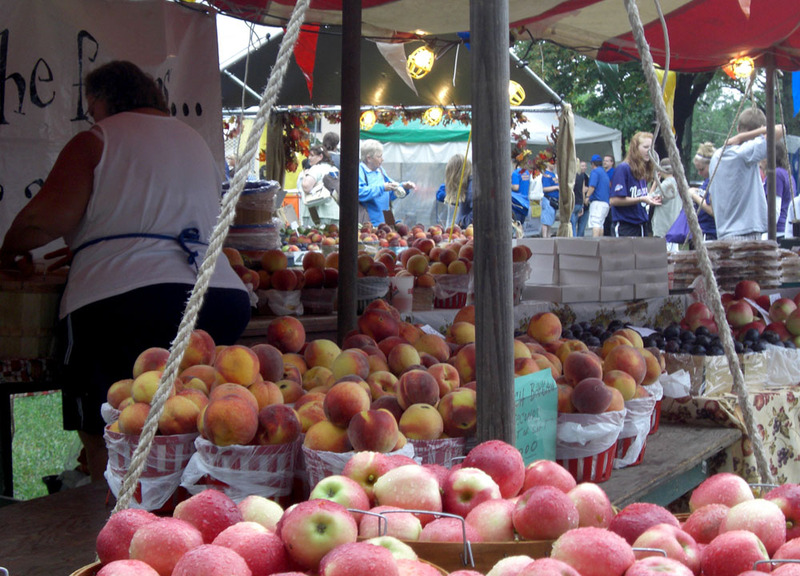 This is also the weekend of the Niagara Peach Festival. You may wish to spend some time checking out the peach related foods and activities! Free time in Niagara-On-The-Lake to explore and do some shopping in the quaint shops & cafes and also visit the peach festival. Wine tastings at two wineries included. Tour of the vineyards and winery at the brand new Niagara College Wine Visitor + Education Centre included. 7-course Italian banquet feast included. 100% full refund if you cancel 7 days before the trip departure date. 11:10 AM -- Burlington Carpool Lot, Guelph Line & QEW. 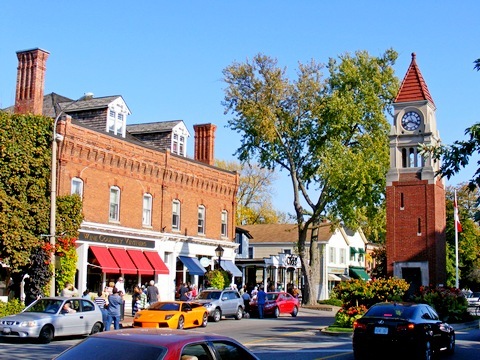 Our first stop today will be the quaint village of Niagara-On-The-Lake. 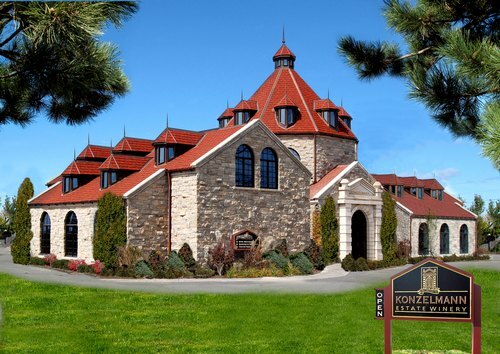 After spending time in the village of Niagara-On-The-Lake, we will visit Konzelmann Estates Winery, one of the very few lakefront wineries in Niagara-On-The-Lake. 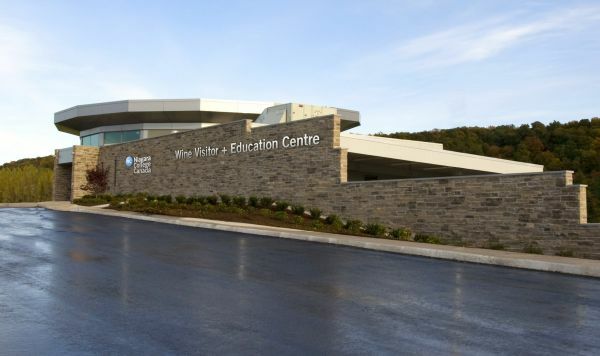 Our second wine tasting stop will be the Niagara College Wine Visitor + Education Centre, a $3.6 million new facility set among 40 acres of teaching vineyards at the base of the Niagara Escarpment, a UN World Biosphere reserve. The WV+EC was opened following a historic visit by His Royal Highness the Prince of Wales. As a gateway for the Niagara wine region, the Centre celebrates the Ontario and Canadian grape and wine industry through informative displays and an information centre to assist visitors in their exploration of wines and wine country. You will receive a tour of this facility as well as the vineyards, followed by a tasting of 3 wines. On our way back to Toronto we will stop for our dinner in St. Catherines. It's a veritable feast consisting of a 10-item Italian banquet dinner. Our menu will consist of the following.